my first attempt at knitting. 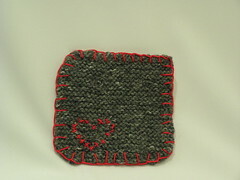 a lovely potholder! anyway, i know it has three rounded corners and one square one. i gained some stitches (from where i do not know) which rounded the first corner, so I followed suit for the other two. i do like the little heart, though. oh, and happy thanksgiving. i have a lot to be thankfulf for in my life - first and foremost my wonderful relationship with my amazing partner. he treats me with so much love and respect, he is brilliant, funny, creative... and an awesome business partner as well. we had a great day together today and i look forward to many more to come. i am a lucky girl! I figured the pointy corner was to attach a thing to hang the square from, like to hang as a decoration on xmas trees, if one has xmas trees. Which is to say, I thought you meant to do that. Yaaay for turning yarn into real things! I'm gonna learn how someday. It really isn't all that hard, the challenge is in being consistent doing it over and over and over. I have been told that crochet is actually easier - but one thing at a time, heh... (like I ever really manage to take that approach!) What I like about it is that you can hang out and talk while you're doing something useful. as a child. I think I remember how to crochet and in fact, I mentioned wanting to pick it up again when we were at my exes new apt. I asked if I could SNOOP (a favorite pastime of mine) through her jewelry boxes and special drawer... and when I did I came across lots of memorabilia of me and us - our time together in the way of gifts. It made me smile... huge. Then I found a simple crochet hook, tucked away inside the bottom drawer of that box. Your potholder is lovely - may it protect your delicate and talented fingers during cooking for years to come! Anyway, I say, go for it! The worst that could happen is that you have to unravel it... and it's a lovely cozy activity for wintertime. Thanks for the kind comment. Nice to meetcha. Mind if I ask how you found your way here? its beautiful! yay for you! Would LOVE to see you at my noggy thing next Friday...send me your email addy to actiongrl @ my place of employment...yknow, burningman.com. FYI: Accidental increasing is the number one stumbling block for new knitters. It usually happens when you have the yarn in *front* of the needles when you knit a stitch, instead of behind the needles. When that happens, the yarn makes an extra wrap around the needle that looks like a stitch. When you go back across the row, it's easy to knit that extra wrap and then presto -- new, unintentional stitches. The way to beat it is to remember that the yarn goes BEHIND the needles before a knit stitch and IN FRONT of the needles before a purl stitch. Do that, and count the stitches on every row, and your squares will remain square-y!